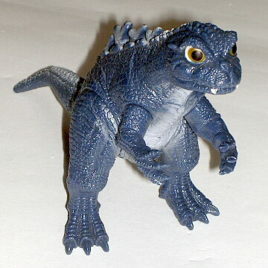 This is the hard vinyl Baby Godzilla figure issued by Bandai in 1993. Baby Godzilla was featured in the movie Godzilla vs. MechaGodzilla 1993. It stands approx. 5 1/2 inches tall. Articulated. This hard to find Baby Godzilla is an Near Mint Condition Vintage Figure No Tag. This is the hard vinyl Jet Jaguar figure from 1993. 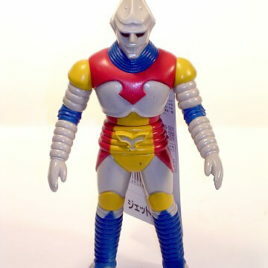 This wonderful Jet Jaguar stands approx. 7 inches tall and is articulated at the arms (so he can be posed to fly). This figure is in Near Mint Condition (with very minor paint rubs) with a Mint Condition Attached tag. This is the HARD TO FIND, hard vinyl Kamikaris figure from Bandai 1993. 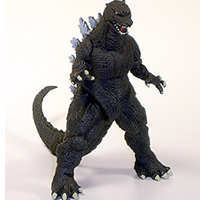 Kamikaris was featured in the1967 movie "Son of Godzilla" and again in the movie Godzilla Final Wars. The figure is highly detailed and is approx. 6 inches long. The upper body (head) and each leg or weapon is articulated. This figure is in near Mint condition (paint rub on right eye) with a near Mint condition (perferated type) attached tag. If you like Kamikaris, you will LOVE this figure! This is the 1993 Version of Mechagodzilla produced by Bandai for the Toho Movie Godzilla vs Mechagodzilla 1993. This NOW HARD to FIND Figure stands about 8 1/2 inches tall, articulated at the arms, neck, and waist. This figure is in NEAR Mint Condition with an EXCELLENT Condition Tag. The figure is hard vinyl. Please scroll down for more photos. Here is one of the harder to find Bandai Vinyls: Kamakirus also sometimes spelled Kamacuras Kamikuras Kamikiras was produced in 1993 and never re-issued. Kamakirus was Giant Praying Mantis from the Toho Movie Godzilla's Revenge. This figure is articulated at the waist, all four legs and both pinchers/saw/knife thingies! This figure is Mint to Near Mint condition No Tag. A Very Beautiful Figure and HARD TO FIND EVEN IN TOKYO!! Scroll down to see additional photos. This is the hard vinyl VINTAGE King Seesar figure issued in 1993. The figure stands approx. 8 inches tall. THIS FIGURE IS ALMOST IMPOSSIBLE TO FIND!! Articulated at the arms, legs and tail. THIS IS A MINT FIGURE with an EXCELLENT CONDITION TAG. Scroll Down to see more photos. 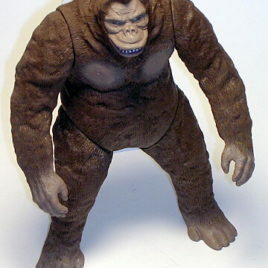 This is the hard vinyl King Kong figure issued in 1993. King Kong was featured in both King Kong vs. Godzilla & King Kong Escapes. The figure stands approx. 6 1/2 inches tall and is articulated at the legs and arms. This figure is VERY HARD TO FIND EVEN IN JAPAN!! This figure is in Near Mint Condition with NO TAG. May have some slight scuffs. 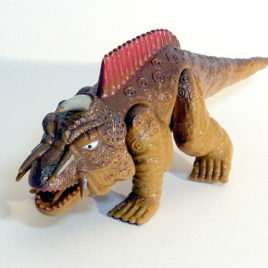 This is the hard vinyl Gorosausus figure issued in 1993. Gorosausus was featured in King Kong Escapes and again in Destroy all Monsters. The figure stands approx 7 1/2 inches tall. We love the texture of his skin. COOL! Articulated legs, arms, tail and neck. This figure is in Mint condition with NEAR MINT Condition Tag. The tag shows a little discoloration or slight creasing. HARD TO FIND! Please scroll down to see additional photos. 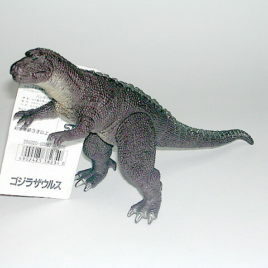 This is the Godzillasaurus that was released in 1993 by Bandai. Godzillasaurus was featured in the 1991 Toho Movie Godzilla vs King Ghidorah. In the movie. Godzillasaurus evolved into Godzilla. It is a hard vinyl figure which stands about 6 inches tall and about 7 inches long. 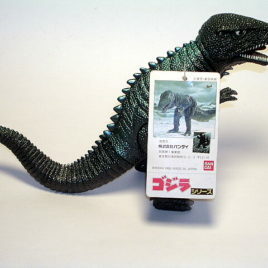 There were three versions of the Godzillasaurus produced. One came in a blister pack with the closed mouth Godzilla and did not have a tag. The other was released on its own with a tag, the other was in the memorial box and is softer vinyl with a different paint scheme. This figure is MINT condition with an Excellent Condition tag (There are some small brownish age spots on the front of the tag which don't show well in the photo). Scroll down to see additional photos. 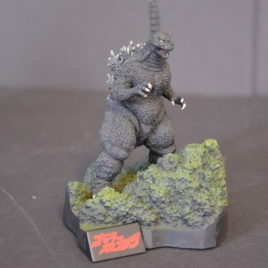 This is the hard vinyl Baby Godzilla figure issued in 1993. Baby Godzilla was featured in the movie Godzilla vs MechaGodzilla 1993. It stands approx. 5 1/2 inches tall. Articulated. 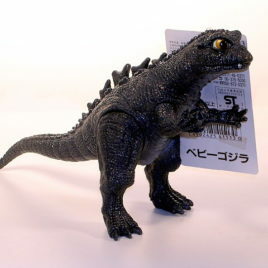 This hard to find Baby Godzilla is a Mint Conditon Figure with Excellent Tag. The tag would be Near Mint condition but there is a flaw that makes it Excellent rather than Near Mint: the back of the tag had some type of sticker which someone pulled off. Scroll down to see additional photos. GODZILLA vs. MECHAGODZILLA 1993! This is a Beautiful PHOTO STYLE ONE SHEET JAPANESE THEATRICAL POSTER. 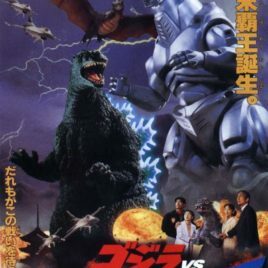 Godzilla vs. MechaGodzilla 1993 was part of the HEISEI GODZILLA SERIES. This Japanese one sheet is approx. 20 1/2 by 28 1/2 inches. MINT CONDITION. GODZILLA 1993! From the Yuji Sakai Diorama "FINAL" Set. The Amazing detail on this set of "FINAL" Yuji Sakai Dioramas is just AWESOME!! Each vinyl diorama stands approx 5 inches tall and each depicts an action scene from famous Godzilla movies. This is Godzilla 1993 from Godzilla vs. MechaGodzilla! DOES NOT COME with BOX CLAWMARK TOYS WARNING: Not for very young children due to small parts! This Bandai "Candy" toy series (named because each box contains a little packet of candy) was produced in 2000 for the release of the Toho movie Godzilla vs Megaguirus. The Super Real Godzilla series had 6 figures in individual boxes. This is the Mecha Godzilla 1993 figure which stands about 3 1/2 inches tall. The Mecha Godzilla stands in his staging station diorama base ready to go into action! He is Equipped with the GARUDA Super Weapon on his back!! Each figure requires easy snapping together. Each base can snap together with other bases from the series. The parts are vinyl and plastic. The series is out of production SINCE 2000 and hard to find. Not recommended for children under the age of 4. This is the NOW VERY HARD to FIND LIMITED EDITION ACCESSORY SET SUPER WEAPON GARUDA to go with the second in a NEW SERIES of Action Figures by Bandai 2011 called S.H. MonsterArts Bandai Collectors Shop. This set is becoming RARE and the price in Tokyo is skyrocketing so GET IT NOW. This is a new standard figure series that incorporates the Bandai action figure art under the theme Pursuing Character Expression through Monster Action. THE SUPER WEAPON GARUDA MEASURES APPROX. 5 INCHES LONG. EACH BARREL IS ARTICULATED TO POINT FORWARD WHEN MOUNTED ON THE MECHAGODZILLA 1993. THE ACCESSORY SET ALSO CONTAINS AN ADDITIONAL "BACK PLATE" FOR THE MECHAGODZILLA TO MOUNT THE GARUDA ON. The MechaGodzilla 1993 is SCULPTED BY YUJI SAKAI! THE GARUDA COMES WITH DISPLAY STAND AND SUPER ELECTRIC RAYS TO BE MOUNTED ON THE GARUDA BARRELS FOR DISPLAY. The ACCESSORY SET comes MINT IN BOX. CLAWMARK TOYS WARNING: Not suitable for very young children due to VERY small parts. RECENTLY RELEASED in JAPAN! This is the second in a NEW SERIES of Action Figures by Bandai 2011 called S.H. MonsterArts which "is a new standard figure series that incorporates the Bandai action figure art under the theme Pursuing Character Expression through Monster Action. This AMAZING new MECHAGODZILLA 1993 style figure has EXTENSIVE articulation so that it can be posed in many ways that previous technology did not allow. The figure comes with an additional "belly LAZER weapon" that can be attached. 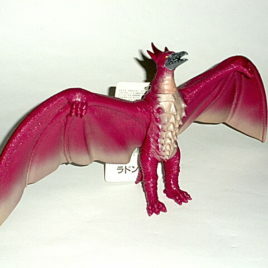 It can even be put in a FLYING pose with the supplied extra tail, hands and neck (an additional cradle stand is required for displaying in flying mode; not included). SCULPTED BY YUJI SAKAI! The figure is made of fairly heavy vinyl. It stands about 6 1/2 inches tall. The figure comes MINT IN BOX with *** RAINBOW LAZER RAY *** attachment and stand to support it. CLAWMARK TOYS WARNING: Not suitable for very young children due to small parts. PLEASE Scroll down for additional photos. 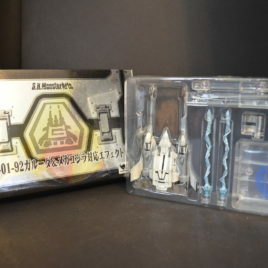 Here is a rare and unique Godzilla Item; the 40th Aniversary Match Box Puzzle Set. It was produced in 1993 for distribution in 1994 to celebrate the 40th Anniversary of Godzilla. The first Godzilla movie was made in 1953 and released in 1954. The set contains 20 match boxes. On the front of each box is a rendering of a theatrical poster associated with all twenty Godzilla movies from 1954 to 1993. The back of each box contains a part of a puzzle which when put together shows Godzilla standing against a red background. This set is packed in its original box with a clear plastic slip case cover. THIS SET IS FOR COLLECTORS ONLY!! CLAWMARK TOYS WARNING; THIS SET CONTAINS ACTUAL MATCHES AND IS NOT FOR CHILDREN. This set is very, very, hard to find so we will call it RARE. It is the GODZILLA DAISHINGEKI (Big Battle) Charafullworld (Japinglish for Colorful World) Boxed Set by Bandai 1993! This is truly an UNUSUAL set filled with beautifully detailed figures of King Ghidorah, Mecha King Ghidorah, Godzilla, Mecha Godzilla, Mothra, Battora, Battra Larva, Mothra Larva and Gigan. It is INDEED a colorful world; the colors are vivid and unlike any we have seen in other box sets by Bandai. Each brightly painted figure stands approximately 3 inches. THIS IS AN INSTANT COLLECTION! Vintage piece: Figures are in MINT condition; however the box is Near Mint to Excellent. This is a very nice collector's piece. CLAWMARK TOYS WARING: NOT SUITABLE FOR VERY YOUNG CHILDREN DUE TO VERY SMALL PARTS. DX MECHAGODZILLA 1993 WITH GARUDA!! This AMAZING MechaGodzilla stands approx. 10 inches tall. The GARUDA SPACE VEHICLE can be placed on MECHAGODZILLA or can be used separately for display. Powered by two AA Batteries (BATTERIES NOT INCLUDED), MECHAGODZILLA ROARRRRS and his EYES AND MOUTH LIGHT UP when you pass the magnet over his chest. THE MAGNET IS IN THE COLORFUL G FORCE DISK. 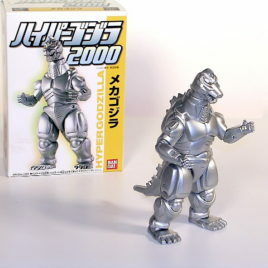 Highly articulated, this MechaGodzilla is made of shiny BRIGHT SILVER PLASTIC. His mouth can be posed open or closed. MECHAGODZILLA 1993 COMES WITH TWO BACK PIECES..ONE FOR MOUNTING THE GARUDA ONE FOR STANDARD OPERATION. 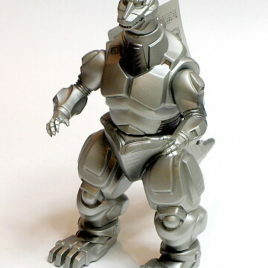 This DX MECHAGODZILLA 1993 IS VERY, VERY HARD TO FIND EVEN IN TOKYO!! **Tail must be "Snapped" into place. ** COMES MINT IN NEAR MINT BOX. CLAWMARK TOYS WARNING: NOT SUITABLE FOR VERY SMALL CHILDREN DUE TO SMALL PARTS. You may have to rub the G Force Disk over the chest several times to hear him roar!! USE NEW BATTERIES!! DX MECHAGODZILLA 1993 WITH GARUDA!! This is in Mint Condition. This AMAZING MechaGodzilla stands approx. 10 inches tall. The GARUDA SPACE VEHICLE can be placed on MECHAGODZILLA or can be used separately for display. Powered by two AA Batteries (BATTERIES NOT INCLUDED), MECHAGODZILLA ROARRRRS and his EYES AND MOUTH LIGHT UP when you pass the magnet over his chest. THE MAGNET IS IN THE COLORFUL G FORCE DISK. 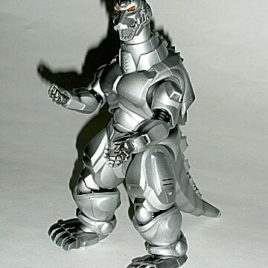 Highly articulated, this MechaGodzilla is made of shiny BRIGHT SILVER PLASTIC. His mouth can be posed open or closed. MECHAGODZILLA 1993 COMES WITH TWO BACK PIECES..ONE FOR MOUNTING THE GARUDA ONE FOR STANDARD OPERATION. You may have to rub the G Force Disk over the chest several times to hear him roar!! USE NEW BATTERIES!! 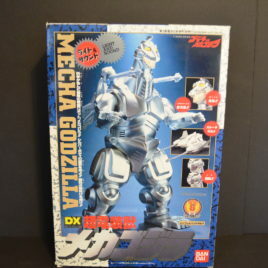 This DX MECHAGODZILLA 1993 IS VERY, VERY HARD TO FIND EVEN IN TOKYO!! **Tail must be "Snapped" into place. ** MINT Condition Box. CLAWMARK TOYS WARNING: NOT SUITABLE FOR VERY SMALL CHILDREN DUE TO SMALL PARTS. Scroll down for additional photos. From the 1968 Daiei Movie Gamera vs Viras aka Destroy All Planets comes Bandai's version of the tentacled giant squid like SPACE MONSTER. The figure is made of hard vinyl and stands approximately 10 inches. VIRAS is articulated at the neck and two tentacles. This one is Mint condition with a NEAR MINT tag. Please scroll down to see photos. 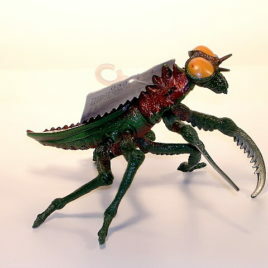 GAMERA FOE EVIL JIGER!! 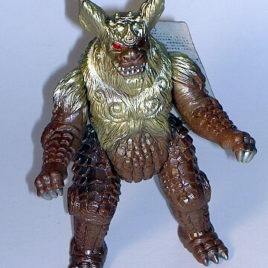 This is the hard vinyl Jaiger figure issued in 1993. The figure is approx. 8 inches long. Articulated at the arms and legs. NEAR MINT CONDITION FIGURE WITH NEAR MINT to EXCELLENT TAG. Scroll down to see additional photos.